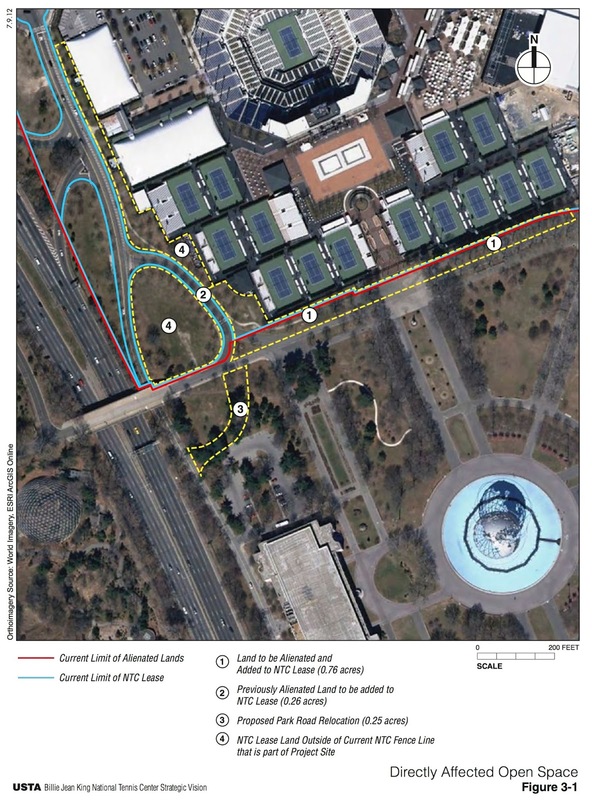 The expansion would utilize an additional acre of public parkland, remove more than 400 trees, bring in an additional 80,000 people, and increase traffic in Flushing Meadows-Corona Park which is already severely impacted by the USTA. Queens Community Board 7's Parks Committee convened forty-eight hours after a lively full-board meeting where more than a dozen members of the public came out to testify in opposition to the USTA's controversial $ 500 million dollar plan to expand again into Flushing Meadows-Corona Park. The Parks Committee expected the Parks Department and the USTA to come back with concrete financial numbers to be spent on "park improvements," in exchange for being allowed to build on almost an acre of parkland. Instead, officials spent a good portion of the night avoiding questions and answering in half-truths. Queens Community Board 7's parks committee meeting. (Photos: Geoffrey Croft/NYC Park Advocates) Click on images to enlarge. Board members brought up a host of issues - the loss of parkland, destruction of trees, increased traffic and pollution, high prices of playing at the National Tennis Center, and the city's lack of commitment to take care of the park among others. Despite repeated requests from the board the USTA has still refused to put its expansion presentation on-line for all to see. For a second consecutive CB 7 Parks committee meeting, the USTA's Chief Operating Officer Daniel Zausner had problems accurately remembering prices the National Tennis Center charges the public to play. The USTA once again failed to provide any evidence that would prohibit them from building the new stadiums on their existing footprint. The issue of objectivity relating to the creation of the project's EIS was also raised. The document was created by the government's favored environmental review company, AKRF, paid for by the USTA, and reviewed by the Parks Department - the lead agency charged with ushering this proposal through. According to the USTA, one of the main rationales behind the proposed park land grab is that it is necessary to remain competitive. The expansion would allow the tennis group to pay top players more money in order to prevent them from opting out of the US Open in favor of attending to up-and-coming foreign venues/tournaments like Dubai, the United Arab Emirates state located in the Persian Gulf. Over many months, the USTA has repeatedly told the public, including the media, that building two new stadiums would help ensure the U.S. Open would not lose marquee players to other more lucrative foreign markets. On Wednesday, though, Mr. Zausner seemed to try and distance himself from these comments. "That is a reality for us, that is not the community board's problem," he said ignoring the position this proposal is putting the community in. "We will continue to do what's necessary to continue to attract the super stars of the world to play in this tennis tournament but I don't believe the community boards have to concern themselves. That is our problem, not yours." As he has done in prior meetings, Mr. Zausner tried to minimize the impacts the entire proposed expansion would have by focusing solely on .68 acres - other land was alienated in 1993, but not used, bringing the total land to be built upon now to .98 acres. The so called "tear drop" park area, which is included in the total expansion, includes much of the land where the planned removal of more than 400 trees is to take place. He described the land they propose to take this time around as a "20-30 feet wide underutilized asphalt roadway" that they will turn into a "landscape buffer and a pathway" which will be "open to the public - six am to midnight eleven months of the year," he said. "We can't physically replace these two stadium without taking this asphalt strip and turning it into a landscape buffer, " Mr. Zausner said. This was a description that at least one board member took exception with. "You got to remember, their property isn't their property. There's a huge fence that goes around their property so the kids in there have to come from the Passerelle (building entrance) to get in there," said CB 7 board chair Eugene Kelty. "It's not like they just walk off the fields and just walk right in on their property. Where the kids have the main part of Flushing Meadows-Corona Park, this area is controlled...they have to come into the entrance by the Passerelle," he said. The expansion is a lot more than .68 acres. Board member Dr. James M. Cervino, a marine biologist, asked numerous questions about the loss of trees and park acreage and potential environmental issues. At one point he put that to the side and attempted to get an answer on a personal level. "How do you feel about this? You work for the Parks Department. You're going to give up and lose what you've gone to school for, what you've learned about all your life," he asked Joshua Laird. "I would like to know from you, how do you feel about this loss?" "The Parks Department is endorsing this project," Mr. Laird replied. "The Parks Department supports this expansion." "It's sad to hear that. It's sad to hear that," Mr. Cervino replied. As they make their way through numerous community board meetings, details of the USTA's operation are being revealed. The USTA made $ 275 million last year, the vast majority from funds generated at Flushing Meadows-Corona Park. However, they gave just $ 2.5 million back to the city as per their license agreement. What ever money is left over "is redistributed to 17 sections" throughout the country, including places like California and Arizona, according to the USTA's Chief Operating Officer. "After you take all the expenses of operating the US Open and all the community projects across the country - let's say there is sixty-million dollars - that sixty-million dollars gets spent across the country to grow the sports to make it affordable for kids to participate in programs everywhere in the country not just in the New York area," said Daniel Zausner. "There is no profit left over." USTA's Chief Operating Officer was asked if they had planned on increasing funding for programming in the New York area as a result of the additional $ 4-5 million dollars they expect in new revenue as a result of the expansion. "In addition to what we are already funding in the New York area - on an annual basis? No," Mr. Zausner responded. "I understand you spend all your money across the country but you know something - across the country they don't have to go through what we do when you have your events," said CB7 member Pablo Hernandez. Destroying Parks to "Save Them" - Let's Make A Deal? Starved for so long of the resources needed to maintain our public parks, Community Boards have increasingly resorted to the "Let's Make a Deal" mentality in order to vote yes on this types of projects. CB 7 Chair Eugene Kelty and 1st Vice Chairperson Chuck Apelian continue to push for extracting funds from the USTA for the park. They suggested creating capital and maintenance funds specifically for Flushing Meadows-Corona Park, paid for by the USTA. Mr. Apelian said that the USTA had "opportunity" to become "stewards" of the park. Council Member Julissa Ferreras's representative also asked about the establishment of such a fund. "The point we are saying now is that they are going to finish up their nice hunk of property here…the cost of everything goes up, your fees go up I'm sure your dues go up and so does the cost of operating that park that what is what I think this board would be looking for. 'what are we getting back for the community' "If we are going to put something over there we would like to see some capital fund for the park and we would also like to see some kind of maintenance fund in place in perpetuity with this lease." When asked to provide a specific dollar amount the USTA is committing to spend, they declined, saying the community board will have to wait. The tennis official said they were going to follow the same procedure as in the 90's when they went from 20 - 40 acres. They will come back before the Final Environmental Impact Statement (FEIS) is completed. But by then, all of the community boards will already have voted on this proposal, without having any information regarding the dollar value that the Parks Department and USTA attributes to the affected parkland, or the dollar value of the park improvements that USTA would allegedly provide. The Parks Department highlighted two potential park improvement projects as compensation: Restoring the park's pathway system including the area around the Meadow Lake which is prone to flooding - doing ecological restoration and building a bathroom on the west end of the Lake. "There's no plans for a maintenance fund which I believe is what you are asking for," explained Flushing Meadows-Corona Park Administrator Janice Melnick. "The plan is going to do capital improvements to the park but not a maintenance fund," she said. The question of whether or not they would be open to creating such an endowment was met with no response. "We keep skating around this thing we've got to nail down and I think its important a this point a capital contribution and an expense contribution going forward on this project," said Chuck Apelian. "I think the money has to be set aside for both expense on an annual basis and a capital lump sum to fund projects in this park. There is an opportunity to put some seven figures or possibly eight figures into an endowment so that we have dollars that Parks wasn't going to get," he continued. "Show me the beef. You are going to have to come back with numbers and explain to us if you want any chance of an approval of what's going to be dollars and sense is going to be the benefit to this community. "I think if any there is any fighting chance that there's going to be support, there has to be qualifications at this point," he said. "And considering the fact that when we last met my last question to you was, I want a dollar value on 30,000 square feet of premium parkland, and you didn't give me one," said CB 7 parks chair Kim Ohanian. "Our concern is that I heard what Dan (Zausner) said as far as the money they pay in rent and stuff that it goes into the general fund which that's why we're still upset because that means it doesn't make its way back here so that's why the necessity of the capital fund and maintenance thing is earmarked specifically and only for that park and can't be used in any other park," said Eugene Kelty. "So I just wanted to make that statement to you. That while we think about it that is why we asked you to come back with a number." Numerous board members were very interested to know why the land the USTA is seeking to add to its current lease was not being replaced. That question was never directly addressed and instead the board received a 'slight on hand' response. Joshua Laird, Assistant Commissioner for Planning & Parklands admitted that the State legislation "always seek replacement parkland," when the city permanently deposes of parkland but he was less forthcoming about when it leases the land. He admitted that the project requires state alienation approval but avoided addressing why the land was not being replaced when asked. He attempted to justify not replacing the land in this instance by making a distinction between the city leasing the land and not disposing of the land. He tried to make the argument that because the land is being leased instead of being disposed of the land does not need to be replaced. Janice Melnick - FMCP Administrator (l) Joshua Laird, (c) and USTA's COO Daniel Zausner. "There are no regulations or rules or laws on paper that govern how alienation happens," he stated. "It's really based on a legal principle." "The standards for how compensation occurs, the terms under which it can happen are not governed by any sort of written set of rules," Laird said. "In theory the legislature could agree to alienate parkland with no compensation. There's nothing that requires them to seek it. They have in fact for a hundred years or more always required compensation I can't think of any examples that I know of where that has happened. The tradition is that when we are actually selling off parkland we always seek replacement parkland but in instances like this one where the alienation is for a lease hold there have been exceptions, a number of exceptions. That sort of precedent is well established where we're not actually selling off parkland or accepting funding for improvements as the compensation," Laird said. He cited three examples where the Parks Department received compensation instead of requiring the replacement the parkland, none of which were particularly relevant to the current situation though. Land under Battery Park was temporarily alienated in order to allow the MTA to expand the subway station for # 1 line in lower Manhattan. The only apples to apples lease-to-lease comparison that remotely approached relevancy he cited was the building of Brooklyn Cyclones stadium in Coney Island. Although technically a Parks Department-owned lot, it was not being used for parkland purposes. Also important to note: that project was not legally challenged which can be a major factor in holding the government accountable in alienation disputes including compensation and replacement issues. The "biggest example of all," Mr. Laird said was the Croton Water treatment plant being built under Van Cortlandt Park in the Bronx. In that case the state alienated 14 acres of park land land in order to allow the building of a massive facility underground. The government, including the Parks Department, had first tried to get away without requiring the land be alienated. They were sued and forced to acquire alienation approval in order to build it when they lost. "There the compensation was just funding for park improvements," he said. The "just funding" came in the form of hundreds of millions dollars that went to Bronx parks throughout the borough for capital projects. What he failed to specifically mention was that land is being used temporarily to build a "public benefit" water treatment plant under a court mandated order and not for a long-term lease for a private sports corporation. Laird also failed to bring up the only recent applicable example where the city leased parkland for a sports organization, in all likelihood because in that case the land was required to be replaced. That example however did not escape the memory of a board member who raised the issue. In 2005 the city allowed the New York Yankees, the wealthiest sports team in America to seize 25.3 acres of historic parkland in the South Bronx so they could build a new $ 1 billion dollar stadium. However, unlike the USTA, which has been allowed to take more than 40 acres of public parkland in Flushing Meadows Park which had also previously been used for both active and passive recreation, the elected officials in the Bronx case required the parkland be replaced. "We would only agree to the (Bronx) deal…. we were only willing to do that if there were a replacement facility," Laird said on a in a 'what is good enough for the Bronx but not for Queens' moment. 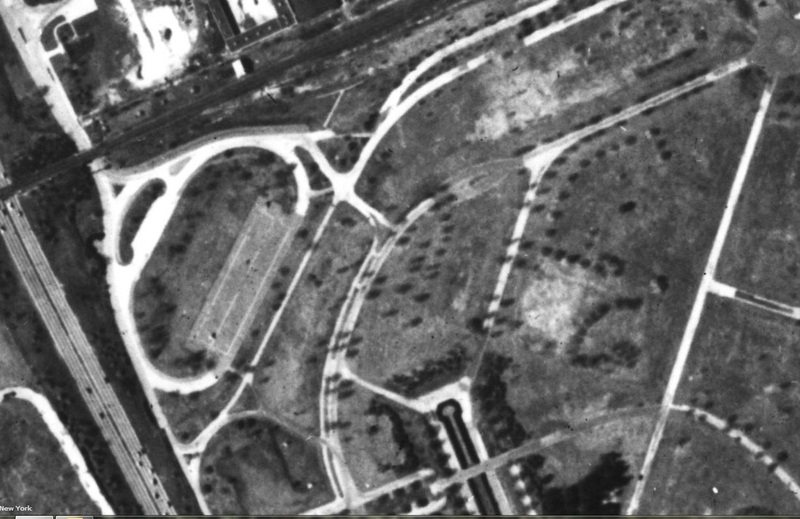 In 1951, the area the USTA currently occupies was parkland used for both active and passive recreation. The answer why the parkland is not being replaced is pretty simple: The Bloomberg administration, in concert with Queens city and state elected officials who represent the area, are not requiring the USTA to replace it. Parks and USTA officials said they have already lined up State Assembly Member Jeffrion L. Aubry and State Senator Jose Peralta to introduce the alienation bill, which does not require park replacement. They did not identify the City Council member who will sponsor a Home Rule message that is also required. People have brought up the promises they remember the USTA made in 1993 when they were allowed to double its parkland holdings. They said they would not seek any more incursions into the park. "I personally wasn't here (at the time) said Daniel Zausner said in response, "I'm not going to use that as an excuse." Laird was asked how the Parks Department would guarantee it would not give more parkland to the USTA in the future. He was not reassuring. He replied that nothing would prevent that in the future. The USTA official sitting next to him did not offer that guarantee either. Laird said, "the real reality is," that the elected officials and the parks department in the future "could come back to this community with a proposal sometime down the road. Laird then offered up a non-credible opinion on future land grabs. He said due to USTA's physical location in the park, any new expansion would not be possible from a practical stand point. "The USTA has really taken up all the land it can…. That's not going to happen," he said of any new expansion. "I'm still not hearing some type of outrage that we are going to just for a private developer to clear cut a forest... for a profit-making developer…. We are taking away an ecosystem. ..You did this already in 1993 when you promised not to take another inch," said Dr. Cervino. He said giving up parkland "goes against what the parks department mission statement really is. I would just like some sort of a moral outrage from the New York City Parks Department." When is it going to end?" he asked. Board member Pablo Hernandez asked USTA's Chief Operating Officer Daniel Zausner about the hourly rates they charge the public for playing tennis in the park. "If you or I just decided that we wanted to come out their tomorrow and play on a court during the day I think it's - the indoor courts are $ 32 dollars the outdoor courts are $ 24 dollars," Zausner said. A few minutes later when it was pointed out that the hourly rates actually go as high as $66 and $ 32 respectively as posted on USTA's website and on flyers available at the National Tennis Center, the USTA official flatly denied it. "Not factual," Mr. Zausner responded, "But we could certainly bring all the price sheets with us." At the prior CB 7 parks committee meeting he blamed "the media" for spreading the same inaccurate rate information. "We're used to being lied to," a CB 7 board member said after Tuesday's meeting. What he also didn't mention was that all other outdoor courts on Parks Department property are free for 5 months of the year including the courts nearby in the Flushing Meadows Park this time of the year. The City charges $ 200 for the remaining seven month outdoor season. The exorbitant rates they charge has been raised repeatedly. Prices that for some reason USTA's Chief Operating Officer has repeatedly had problems accurately remembering at recent public meetings. Mr. Hernandez also asked if the budget for the National Tennis Center's was available online. That was not answered. Towards the end of the meeting Phil Konigsberg asked if the public would be allowed to address the board. That request was denied by CB Parks Chair Kim Ohanian. In a surreal moment he then asked if he could read a statement from a Flushing resident but he had to get permission first. "I think you should read that first and make that decision madam chair," offered board Chair Eugene Kelty. Kim Ohanian skimmed the document. "That's not short," she said. "Go ahead," she said passing the letter back to him, "read fast." Konigsberg read the letter from a Flushing resident who has lived in the area for the past 47 years who was unable to attend Monday's meeting. "As a Flushing resident for over 47 years I join my neighbors in their overwhelming oppostion of the proposed USTA expanstion," the letter said in part. "Park land by law is parkland forever. No business has a right to take away what belongs to the people. Yes, park land belongs to the people. Park land is not owned by the Mayor, a city council member nor a state legislature. When elected officials sell their souls and do not work for the public interest it is up to us, the people, to stand up and be heard. The people are shouting, "Leave our parkland alone!" I am confident that this community board made up of community leaders will reject the USTA expansion proposal. Enough is enough." Board members also expressed displeasure over the Parks Department using it's extremely limited horticultural resources to beautify the areas around the US Open instead of the USTA footing the bill. "Yes, there are areas in the park that we beautify before that event (US. Open) and I would like to say before any large event we have in the park," said Janice Melnick, Flushing Meadows-Corona Park Administrator. However, when Ms. Melnick was asked to provide any other examples of where they specifically beautify areas before other major events, she was unable to. "We do plant before the US Open. We plant a tennis racquet with perennials. So yes, we do some work in the park to beautify it before the event," she said. "Maybe we should't have to pay for the flowers, maybe the USTA should pay for the flowers since you are putting the gardener to work… that's less cost that's coming out of the parks budget vs. theirs especially since the racquet represent them," said Eugene Kelty. "We'd like to keep the Parks Department figures down and the USTA figures up." As the night wound down the frustration was apparent. "And yes, the Parks Department really need to do a better job of paying attention to the largest green space in the largest borough instead of spending so much damn attention to Central Park and Prospect Park," said Parks Chair Kim Ohanian closing the meeting. "And we are sick and tired of getting short changed. You guys treat us like crap and we're tired of it. Ok?" she continued. "You spend very little money on this park. You have neglected it, you have treated it like garbage and it's not right. You don't spend enough money to take care of it. You don't have enough help, and don't spend enough money and you don't treat it right. There's no reason why the Fountain of the Planets looks the way that it does. You've neglected it, you've neglected a lot of that park and shame on you." "Please be prepared have answers to the questions that were presented to you tonight." We ask questions we deserve answers. We don't get them they don't get theirs." The meeting was adjourned until the first week in March. There are two other commercial projects currently proposed for Flushing Meadows-Corona Park including a 1.4 million sq. ft mall and a new stadium for Major League Soccer. CB7 parks committee Chair Kim O'Hanian also refused to consider allowing a vote on the USTA application, then and there during that committee meeting. She said that a vote wasn't possible, because there are too many unanswered questions. And yet, as concerns the biggest unanswered questions -- USTA's valuation of the affected parkland, and of the park improvements that would allegedly be provided as compensation -- USTA plainly stated that it will NOT provide that information until the EIS is finalized. That is, until long after CB7 and all other community boards have already voted on this application. Given USTA's refusal to provide the required information to any community board, there was no good reason for the CB7 parks committee to delay its vote on the USTA application. When the committee convenes yet again to vote, they still will not have the answers to the most pressing questions -- USTA has already said so. The only reason to delay the vote, and to require the volunteer committee members to leave their families to attend yet another tedious committee meeting, was to put some distance between the moment of the vote and the strong statement of the opposition that were heard at the February 11 CB7 meeting. CB7's powers-that-be want those opposition statements to be distant memories, when the committee convenes for its vote. They are aiding and abetting approval of this application. You are absolutely correct. Do not let the CB Chair get away with a land grab by volunteer exhaustion. Be vigilant, get the press to report it and keep pressing it. This is designated park land. They can not take it away. Do not give in to the USTA threats either, or the promise of replacement lands, or the promise that they will come up with money to take care of the rest of the park. It will not happen. Push your elected officials to stay the course and get the City Council to do its job - restore public funding, just a mere 1% of the budget to park upkeep. That would be a 300% increase from the pathetic funding today and returns park spending to pre-Koch levels. Just 1%. Oh no, not another park land grab! Everyone in New York City MUST organize to protect our last remaining public asset: our public parks! Bloomberg is closing our libraries, giving our school rooms away to private school developers, closing our hospitals and now, giving our park lands away. Once the land is gone, it is gone forever. It is a complete myth that there will be replacement park! That happened in Brooklyn when the community gave up a park in one place for a hopsital parking garage and now they are closing the hospital for condo development - and so, there goes the unprotected "replacement" parks that are on the hospital grounds. And this is only one example of the non-replacement "park" (that are no longer parks with park-land protections - at least FMCP is a designated park today). Bloomberg bureaucrats will do anything, and falsely promise everything, to pull this last one out for the Emperor in the remaining months of his reign. All Queens residents who care about keeping the middle class and children in the city must rally to prevent this despicable land grab from going forward. Now! USTA is unethical monopoly which does not even truly promote sport or health! Their programs are a joke. Every tournament cost at least $50 to compete for a small child. Lousy camps charge at least $40. The only complimentary thing we saw were cheap soda and chips they give kids on special events after we spent 100s for tickets! New Yorkers do not give them your park! Stay united and stay strong. Write to the White House if you have to!